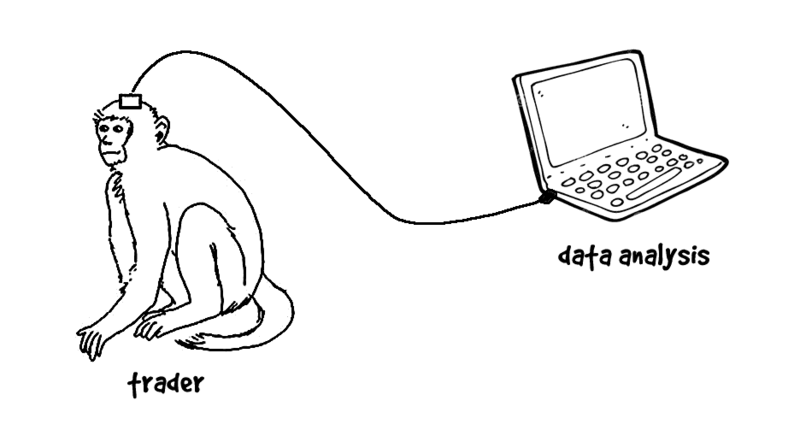 Here at Woobull Labs we take data driven analysis very seriously. 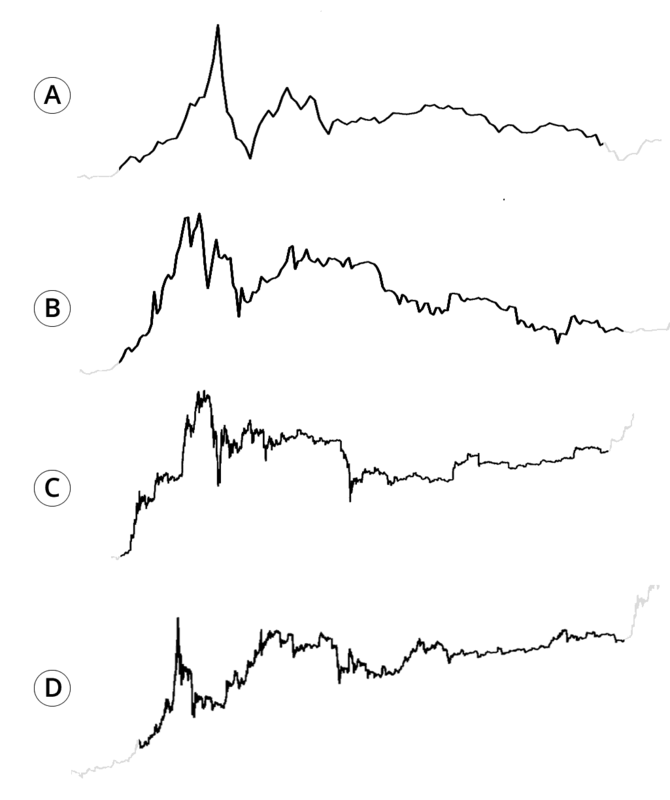 Today, I’m pleased to present the culmination of 4 years of data gathering and analysis on Bitcoin trader psychology. The sketch above depicts the basic rig we used for our epic research. The dataset includes readings over 4 years at 10 minute intervals (210,240 readings per subject). In total we collected the psychological brainwave patterns of 100,000 Bitcoin traders – a staggering 210,240,000,000 data points as they tapped away on their keyboards. After filtering the brainwaves for solely emotion signatures, we found a pattern emerged. 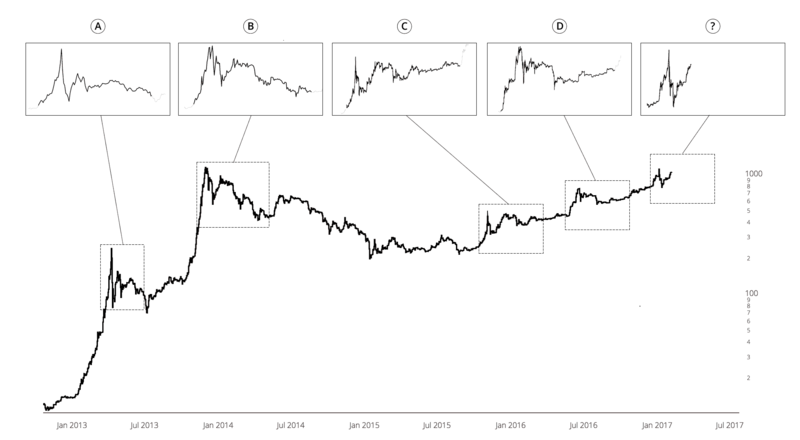 There was a very predictable repeating fractal after each and every Bitcoin mooning. Below are the resulting emotional superposition of 100,000 traders. 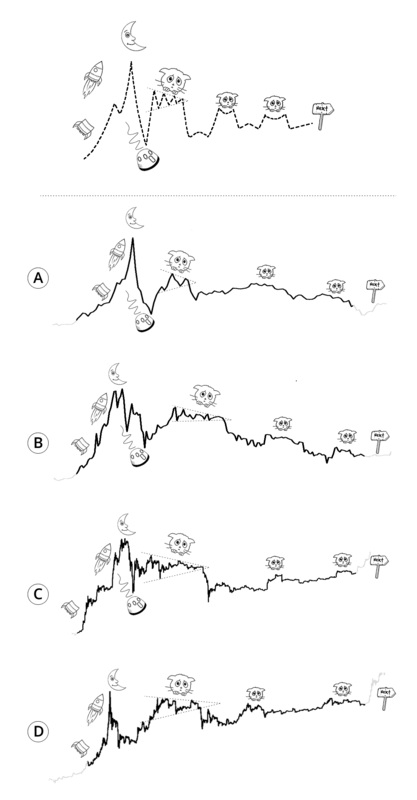 Our scientists have privately coined this brainwave pattern “Soobmee” (Sudden Onset Of Bitcoin Mooning Exuberance). Exhibits A-D were the strongest imprints we found in the 4 year dataset. After many months of signal analysis we were able to map this pattern to define a new and very important predictive trading pattern. 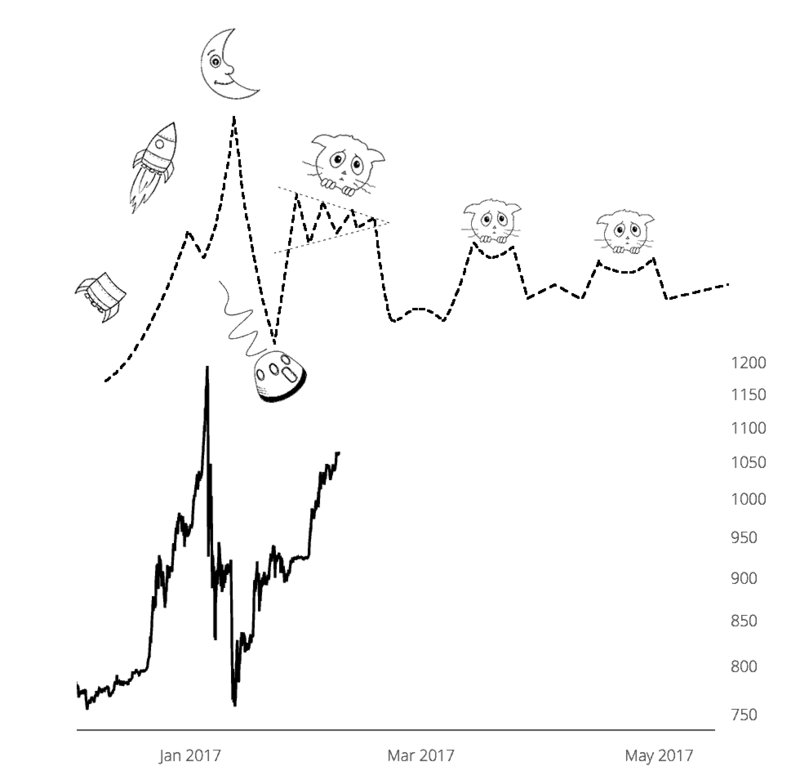 The 3 cats and a moon pattern. A and B shows the pattern playing out in a bear trend, while C and D shows it playing out in a bull market. They may look different, but they are actually the same, skewed onto a bullish or bearish trend line. 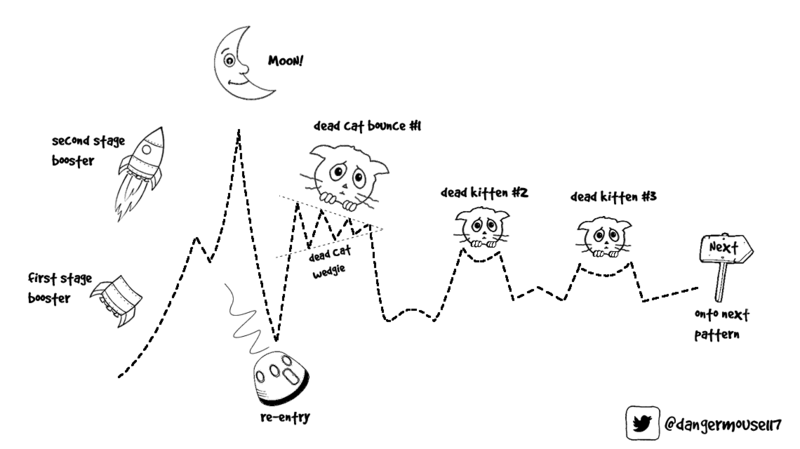 The signalling to watch for is 1 cat and 2 kittens that follow on from a pump and dump. We must reiterate the time to use this pattern is after a Bitcoin bubble has been sufficient to kick in irrational trader exuberance, followed by a confirmation signal of a steep price correction. 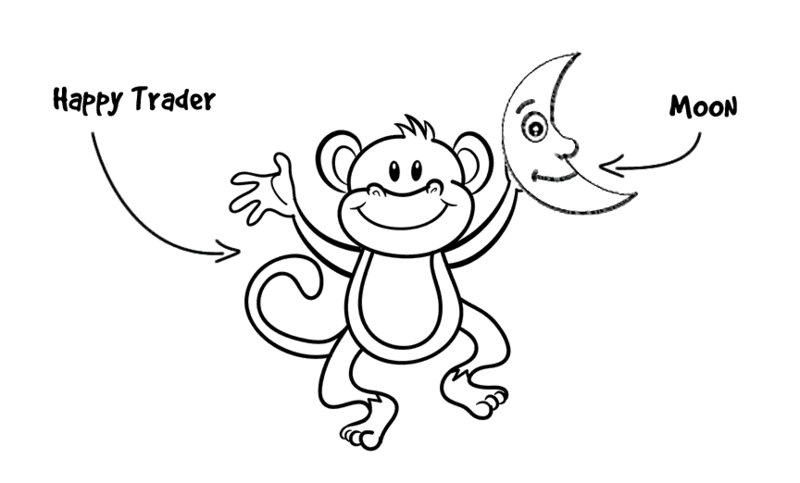 Since the reader does not have the advantage of our brain signalling apparatus, we have a sketch below to help find you find this tell tail signature in the crypto-trading room.